There are still a lot of us who use land-line phones. No sweat. We can keep you hooked up with service over our fiber lines. The voice quality is amazing! 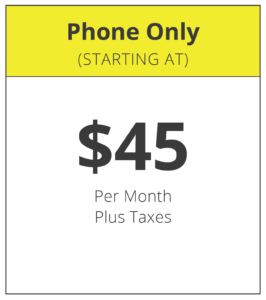 We offer unlimited local and long-distance landline service for $45/month plus taxes. If you work from home and need multiple phone lines, we can give you a rate for that. For only $20 more per month, you can get 250M of our amazingly fast fiber internet. No one else can offer this much internet speed in the county. We’ve been building our own fiber network so we can bring state-of-the-art technology to the area. Interested in bundling? Your total monthly cost would be $65, plus taxes. Contact us today and we will find the best solution for your home. A 24-hour battery is available for a one time added cost. Ask us for details and click here for battery information.